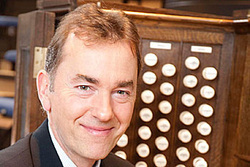 Thomas Trotter presented a concert on the III/57 Schantz pipe organ in the Chapel of the Christ at Martin Luther College, 1995 Luther Court, New Ulm. Thanks to all who joined us on April 17th for this wonderful experience! Read Thomas Trotter's biography here. “Mr. Trotter's supreme musicianship was evident. He was totally engaged in the music. Thus, every composition, in its parts and in its entirety, was alive: it was music. "The concert was a truly memorable experience, featuring one of the half-dozen most outstanding organists I have heard in over 52 years of attending recitals. When students excel their teacher(s) and the teacher is Marie-Claire Alain, you know you have witnessed a world-class talent. It was clear that Trotter had not only made the superb 57-rank Schantz instrument his own but had also polished a familiar program for this second venue his three-stop U.S. tour."